As I am such a dedicated Facebook user I tend to assume everyone in the world is on there already. I’ve recently been meeting a few people who have resisted so far but would now like to start, but not sure how. So if you haven’t yet set up a personal profile on Facebook and would like to join the revolution, here are some simple step by step instructions. 2. Fill out your details in the sign up section. 4. If you do want to set up a page for a business or organisation you can do this via the link at the bottom of the page under the sign up, though I find it easier to first set up your personal profile then set up a page later. 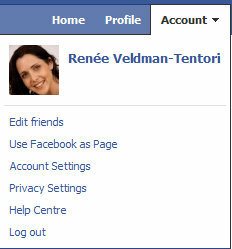 You can read my seperate blog post on how to set up a Facebook page for more information. Just a note – setting up a personal profile and then connecting this to a page for your organisation does NOT automatically mean anyone will have access to your personal details. Once you have a personal profile, you can edit your account and privacy settings (see step 7). Another tip – when filling out your details, make sure you use an email address which you have easy access to, and will continue to do so in the future (i.e. choose a personal one over a work one). 4. After filling out your details click on the green “sign up” button and join the revolution! 5. It’s been a long time since I’ve created a profile but believe Facebook will then guide you through the next steps such as adding a photo and entering information about yourself and your interests. I’ve always felt a good guideline when using the internet is that what you put online is public so don’t upload or share anything you wouldn’t want the world to see. Though as step 7 explains, you can restrict who can see these details. 6. Facebook is not much fun unless you connect to friends and family, so let them all know you are now on Facebook. There are a number of ways to do this, and again Facebook will guide you through it. 7. One of the first things you may like to do is configure your account and privacy settings. To do this, click on “account” in the top right hand corner and chose the relevant section in the drop down list. 8. The next time you sign in, you can go to www.facebook.com and this time just fill in the section at the top and click on “log in” You can check the box “keep me logged in” if you are using a home computer and don’t want to log in every time. Make sure this box isn’t checked if you are using a public computer as if you forget to log out, then others will have access to your account. Though it’s not as exciting for some as others, it’s pure popularity is due to it being such a user friendly and powerful tool to connect with others, so welcome to Facebook!